Did you know that more than 294 billion emails are sent daily? How many unread emails did you wake up to this morning? Email marketing is big business. In 2011, email marketing brought in an average of $40 for every $1 spent and this year, US retailers are expected to send more than 258 billion emails. Well, a recent survey held by MarketingSherpa asked participants to estimate the return on investment (ROI) from their email marketing campaigns. 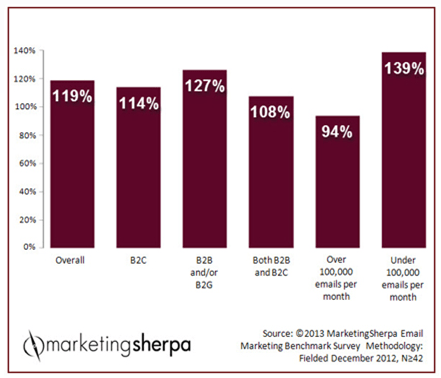 The response was incredible, with marketers claiming an average ROI of 119%. Schoffa, one of Finland’s fastest growing retailers for men and women’s dress shirts have seen their online sales rapidly increase since implementing a more frequent email marketing strategy. Email marketing is a channel all marketers use, yet as much as 97% of businesses get it wrong. It’s common for brands to send one email to their entire subscriber list with a link to their home page and then expect sales to flood in. 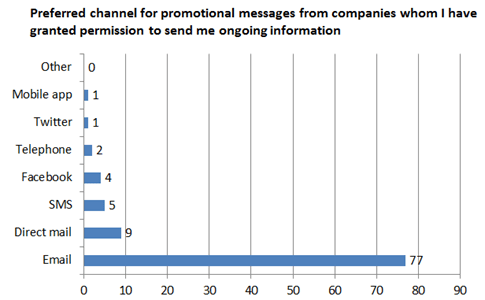 This is not the best approach to take and ultimately leads to a failed sales channel. In April 2012, I wrote a blog post titled “Is email marketing still relevant in a world full of social networks?”. Due to increased social media marketing spend and an increase in the number of Facebook success stories, I came to the conclusion that email marketing was on its way out of the online marketing matrix. I was wrong. In fact, a few months later, research came out that email was the most preferred method of marketing communication with more than 77% of consumers choosing email marketing as the preferred method of contact from a brand. The second most preferred method was direct mail with only 9%. One of the most insightful white papers I have ever ready is the Top 10 Converting Websites report from SeeWhy. The report explains why the top converting websites in the world are able to reach conversion rates of more than 35-40%! This is compared to the average conversion rate for an e-commerce site being 1-2%. By implementing the same strategy as Amazon, Office Depot and Pro Flowers (capturing the email address! ), Schoffa was able to use email in a more strategic approach, which helped sales increase by more than 50%! In the last 6 months of 2012, Schoffa sent 8 emails to their subscribers. During the first three months of 2013, Schoffa has sent out 14 emails. Your first response will be, how well are these emails performing? The statistics remain pretty consistent even though the frequencies has increased the subscriber base has grown. Capturing the email address of a web visitor is one of the first things you should focus on for your website. Once you have an email address, you can target more personalized offers to your reader, which results in higher customer satisfaction levels and increased profits. The days of ‘one-size-fits-all’ are long behind us and when implemented successfully, email marketing is quick, easy and highly effective! 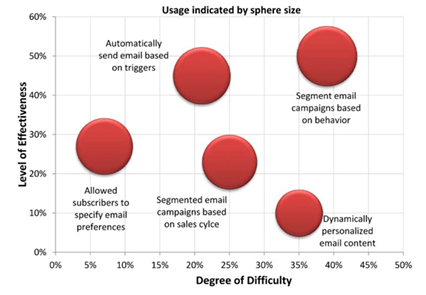 How often do you send emails to customers? Do you think one email per week is too much? Tracking revenue generated from each organic keyword is a common report ran by SEO’s for e-commerce stores. Google Analytics E-Commerce Tracking is a powerful report that makes budget allocation a lot easier as you can see which channels generate revenue. Lead generation websites are different. There is no on-site sale, no e-commerce tracking so therefore SEO’s need to be able to report the number of leads generated from their search efforts. The basic report in Google Analytics allows you to track conversion rate for any given keyword, but SEO’s also need to see which keyword generates the most leads by number, not a percentage. The following explains how to set-up a custom Organic Keyword Conversion Tracking Report that provides data on visits, organic searches, goal completions and goal conversion rate. Before creating this report, it is important to have goal tracking implemented. Without website goals, your analytics loses purpose. Whether your websites goals are sales, to capture leads or download a PDF product sheet, the goals of your website should reflect your overall business goals. Setting up goals will show you exactly how many goals were achieved but also how they were achieved and through which channels. The most common goal is URL destination. For example, if you want to track the number of newsletter sign-ups on your website, once the newsletter form is submitted, the “thank you” page URL is usually www.domain.com/thank-you. In this case, you would enter /thank-you and click save. Note: If you do not add ‘organic searches’, the report will include keywords from your paid search campaigns. You will then need to add ‘keywords’ to the Dimension Drilldowns section (you can ignore ‘filters’). 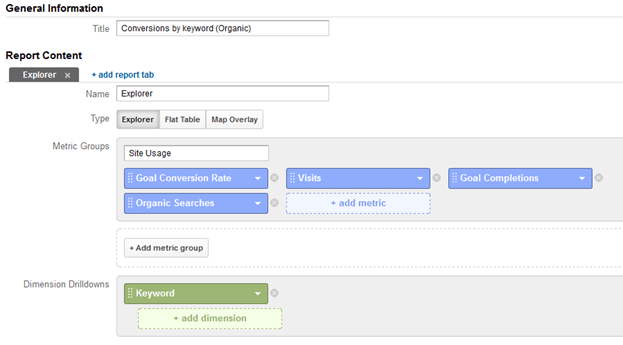 You can now apply the Organic Keyword Conversion Tracking report to all profiles within your Google Analytics account and then click save. Once the report has been saved, the data will be presented. The report will show keywords based on visits to the website. 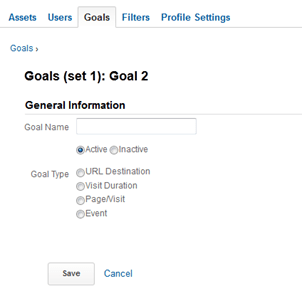 You can filter by goal completions and to view all keywords that convert, change rows from ‘10’ to ‘100’ found at the bottom of the page. As per usual, the report will automatically show data for the last 30 days. Once you have the data, you can then export the Keyword Conversion Tracking Report to Excel and filter the report by branded and non-branded converting keywords. You can also use this data to find any increases in organic leads and view the progress of your SEO efforts. The Keyword Conversion Tracking Report is a simple yet powerful report you can create to showcase your SEO investment is paying off. I want to help you increase your website conversion rates, so I’ve developed a keyword strategy that you can use to grow organic sales. Third: I’m giving my strategy away, for free. What will you focus on in 2013? We asked 7 online marketing authorities for their best tips. Here’s what they said. This has probably been overstated, but I find that most companies are still not treating mobile properly. You should have a mobile site, dedicated mobile advertising, and track conversions and phone calls separately for mobile than for desktops. In just 2012, smart phone adoption increased 55% in the US; and that adoption trend is seen globally. If you don’t have a mobile friendly strategy, you will be left behind by your competition in 2013. Understand your audience before you market to them. You need to feel empathy where they feel pain, feel a desire to help where they have a thirst for knowledge, feel intellectual curiosity when you visit the sources they read – in short, you need to be in their shoes. This won’t just help you create specific marketing campaigns; it will tell you where to market, what to say, how to say it, and even find that perfect product/market fit. Success in 2013 will be all about improving your corporate metabolism and your marketing agility. Look for every opportunity (and the tools) to increase the speed to get things done in as close to real-time as possible. Write really good content. Don’t focus on building links, or getting press or trying to game search engines. Instead focus all of your seo efforts on content marketing as that will produce a higher ROI in the long run then link building. Even if you end up outsourcing conversion, it’s becoming increasingly important that you know the basics yourself. It’s astonishing how many marketers still don’t understand the fundamental concepts, like those we describe in our Split-testing 101 article. As conversion optimization becomes more and more competitive, we need to find new ways to out-convert the competition. At the moment, companies that have an effective strategy across desktop, mobile and social are leading the way – and they’re building a massive advantage over other companies who are just focused on desktop conversions. My top marketing tip for 2013 is to invest in working out attribution. Just over 1/2 of marketers (according to research by Adobe) use any form of attribution, and most of them use last-click. Though it’s challenging to work out the IT issues and to determine which approach to use, the result will be a better understanding of channel contribution to the bottom line (including offline, mobile and social touch-points), which will lead to better marketing decisions. What is your best marketing tip for 2013? Feel free to comment below. 7 out of every 10 customers abandon their online purchases, resulting in over 300 billion dollars of lost E-Commerce sales each year. The top 5 reasons for abandoning are split between price and timing. If a visitor leaves the shopping cart and does not return within the first hour, the probability of them returning to complete the sale is reduced by 90%. With 90% unlikely to purchase from your site within the first 60 minutes of leaving, this means you have a very small window of opportunity to make an impact. Executing an effective remarketing campaign is difficult and why only 26% of e-commerce sites remarket. Remarketing to web visitors that abandon your shopping cart is at the top of US marketers activity list, according to E-Consultancy, One of the main reasons for this is a recent report from Forrester Research that found that remarketing emails can generate nearly 4 times more revenue and 18 times greater net profits compared with marketing using simply non-ntargeted mailings. Shoppers that abandon your website are visitors that almost purchased from you. It’s no surprise that real time, personalized emails within the first hour at highly effective. The more personal and relevant the email campaign is, the more likely the shopper will convert. 1. Send your email remarketing campaigns within the first hour of abandonment in order to keep your brand at the forefront of the customers mind. Remember, they almost bought from you. 2. Personalize and tailor each remarketing campaign to the abandoned shopperr. Address them by name and offer your support in helping the visitor purchase your product or service. They may have left due to a technical error and are in need of assistance. 3. Tell your customer when his/ her shopping cart will expire. Make it clear that you will save the product/ service and you are happy to keep it until X(eg. 30) days before you put it back on sale on the site. 4. Show which item is in the shopping cart to remind the abandoned shopper what they almost purchased. Provide a clear image of the product and support it with guest reviews within the email. 5. Make your call to action prominent and link directly to the saved shopping cart. You want your abandoned shopper to see where to click within the email and that they arrive at the shopping cart checkout page. Do not send your shopper to your home page. Make it as easy as possible. As online marketers look to find new ways to generate traffic and sales, get ahead of your competition and implement remarketing. For best in class campaigns, each email sent will probably be your most profitable campaign, generating up to 100 times the return that you would expect from a regular email campaign. How you seen a significant increase in conversion rate since implementing email remarketing? Please share your comments below.